It’s been a while since I wrote about politics here, both because my fiction writing rightly took precedent and because a lot of my political writing has migrated to Twitter. But I wanted to take a moment to shoot down some liberal happy-talk regarding impeachment. In short, it won’t work. Next weekend is Readercon, for which I am incredibly excited. How could I not be? Check out the amazing panels I’m on! 12:00 PM 6 Back from the Dead. Judith Berman, John Crowley, N.S. Dolkart, Nicholas Kaufmann, Sioban Krzywicki (leader). There are many characters in SF/F who die in what appears to be a permanent fashion, only to be brought back from death. Examples, left intentionally vague to avoid spoilers, appear in Neil Gaiman’s Neverwhere, Terry Pratchett’s Discworld books, George R.R. Martin’s Song of Ice and Fire series, Daniel José Older’s Bone Street Rumba books, and as far back as J.R.R. Tolkien’s Lord of the Rings trilogy and C.S. Lewis’s Narnia books. How do the characters interact with resurrection (their own or someone else’s) and in some cases even prepare for it? When do readers feel like this works and is believable and satisfying, and when does it feel like a cheap trick or a cop-out? What is it like to read these stories while grieving, or keenly aware of one’s own mortality? 7:00 PM 6 Race and Historical Accuracy in Cod-Medieval Fantasy Fiction. S.A. Chakraborty, Phenderson Clark, N.S. Dolkart, Tom Greene, Catherynne M. Valente. Too often, we’ve heard the excuse of “historical accuracy” used to explain the lack of PoC in historical fiction. Yet their presence is profoundly felt throughout European history, including in the medieval era so often used or modified as a fantasy setting: Arabic numbers have been used in Western societies for centuries, philosopher Ibn Rushd preserved and notated the works of Aristotle, the Silk Road brought traders and diplomats from all over Asia, and Moors in Spain were credited with promoting astronomy, medicine, and literacy. This panel will discuss how to populate cod-medieval fantasy novels with characters of color who have dimension, depth, and humanity, while avoiding stereotypes of swarthy villains and uncouth sidekicks. 2:00 PM C Lines of Consent in Fiction. Samuel R. Delany, N.S. Dolkart, Lila Garrott, Kiini Ibura Salaam, Josh Jasper. In science fiction and fantasy, consent is often handled in fuzzy, imprecise ways. Obvious scenarios of non-consent, such as the enslaved house elves in the Harry Potter books, are easily identified as problematic, but less is said about magical destiny that compels an ordinary person to become a hero; inherited magic, rank, or family feuds that empower or endanger a character without their consent; soul mates, who are forced to love and be attracted to each other; werewolves compelled to change shape under the full moon; and other strictures that are so common we’ve come to take them for granted. This panel will discuss work that either explicitly deals with consent or appears oblivious to its relevance, and will explore the writer’s responsibility when placing characters in a scenario (or plot) that hinges on questionable consent or non-consent. Content note: this panel may explicitly discuss violations of consent and their consequences. For the purposes of this panel, trigger warnings and content notes are assumed to be valuable tools that assist the reader. Giveaway ends June 07, 2017. I know I’ve disappeared recently into a black hole of endless work and other stressful things (house hunting, anyone? ), but I absolutely have to tell you about these three posts of mine that have come out this month, all discussing aspects of my series’ relationship with Judaism. The first is over at the Jewish Book Council, where I discuss three biblical passages that particularly influenced my writing. They’re really fascinating passages in their own right, and you should definitely check it out. The second post at the JBC is even dearer to my heart, a response to a 2010 essay in which Michael Weingrad argued that Judaism was inherently better suited to science fiction than to fantasy. In this response I discuss the thing that I feel to be most Jewish about my series: the complete lack of dualism. Lastly, I’ve got a lovely post in ReformJudaism.org about how I ended up writing such Jewish stuff anyhow, when I’d always resisted it in college. 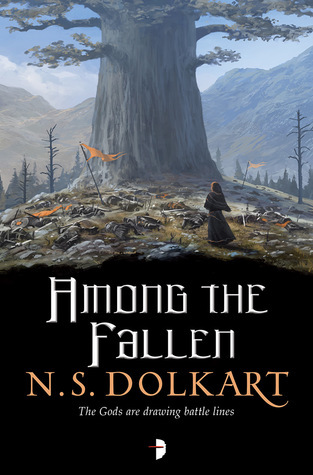 This one also reveals the idea at the core of Among the Fallen, so only read it if you don’t mind some spoilers!